Since Microsoft made Teams Direct Routing available as a preview, I've been working to modify the Skype Optimizer codebase to support it. Finally, after weeks of coding and testing, I'm pleased to announce that the Skype Optimizer now fully supports Teams Direct Routing. O365-native PSTN calling is only available for a small number of countries. A lot of companies have held off from migrating to the cloud until there was some way of allowing PSTN calling for users in the other countries that aren't supported in O365. Direct Routing allows customers basically anywhere in the world to move their users to Office 365 while allowing telephony connections to their provider of choice via on-premises PSTN gateways. Direct Routing in Teams works almost exactly the same as it does in Skype for Business on-premises. The only differences are in how normalization rules are handled (which I talked about in an earlier post), and there is no support for trunk translation rules. This means that if you have to do any manipulation of numbers before sending to another PBX or the PSTN, you will have to do it at the PSTN gateway level. 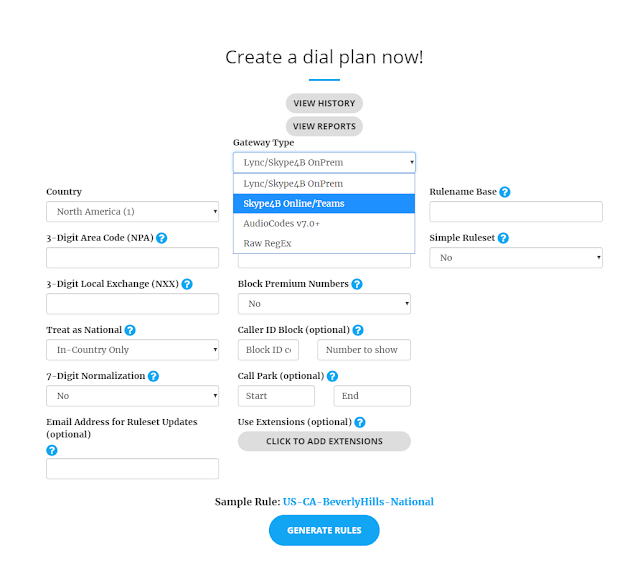 There are still voice policies, routes and PSTN usages that are combined together to provide nearly limitless ways to control how phone calls are routed in your company. The difference is really just in the name of the PowerShell commands, as shown below. The PowerShell script generated by the Skype Optimizer builds on the same codebase used for Skype for Business Online scripts. The only prerequisite is that you have already paired one or more PSTN gateways to your Office 365 tenant using the New-CsOnlinePSTNGateway command. If you haven't done this step, the Skype Optimizer script will only create normalization rules that will apply to both Skype for Business Online and Teams. Please try out the new functionality and let me know if you experience any issues.